Aldhelm (c.639-709), Abbot of Malmesbury and Bishop of Sherborne, wrote 'In Praise Of Virginity' for the abbess and nuns of Barking Abbey; it is likely that some of his relatives were nuns there. 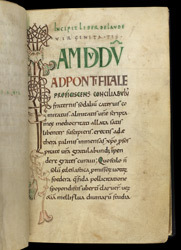 The manuscript was written and decorated at Christ Church, Canterbury, however; the original decoration includes a typical Anglo-Saxon Canterbury style of interlace and biting animal- and bird-heads. Following the preface, the main text is introduced by this initial 'I', running almost the full height of the page, made up of two forms of interlace ornament and biting animal-heads. The indenting of the script to allow for the precise shape of the initial suggests that the initial was executed, or at least sketched out, before the writing was undertaken.